In retail, presentation is everything. You simply cannot skimp on your displays. 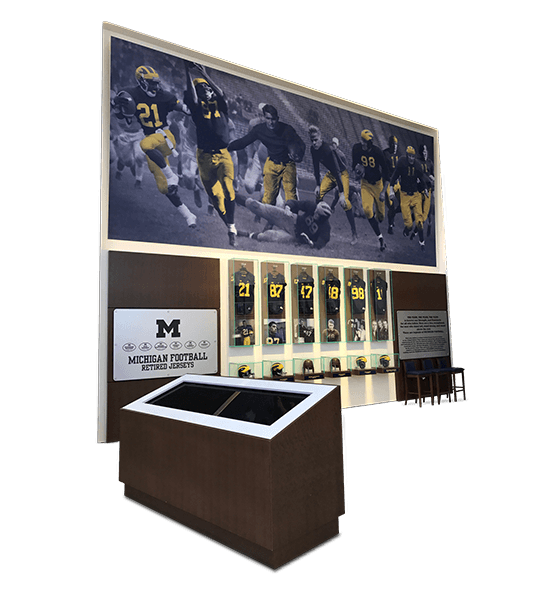 Decades of experience as a plastic display production company have given American Plastic Solutions the expertise to handle your retail display needs and show off your beautiful product. Soup to Nuts and shipping too! 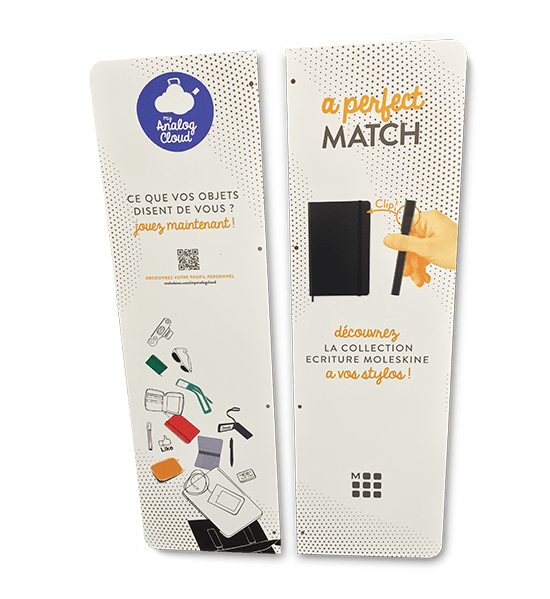 National retail customer wanted a one-stop solution for their new product launch display. Italian consumer products company was shipping assembled retail displays from Europe to the U.S. to develop their North American business. 40% of the these displays were broken during shipment. 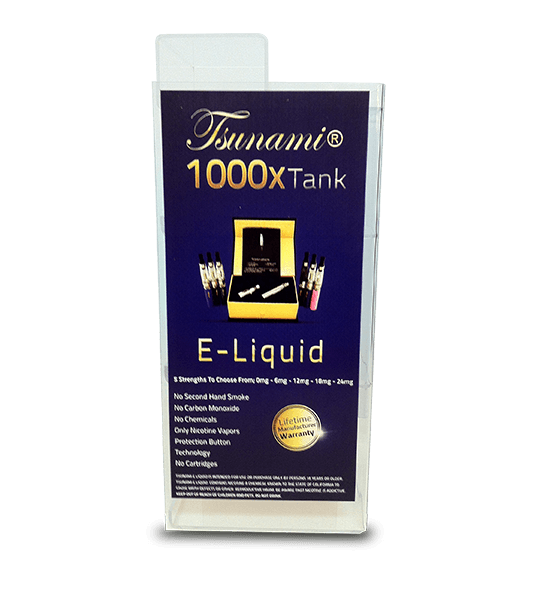 An e-liquid company wanted a countertop display with a bold 4-color graphic to highlight and spur sales growth for their products. Bed, Bath, and Bottoms Up. 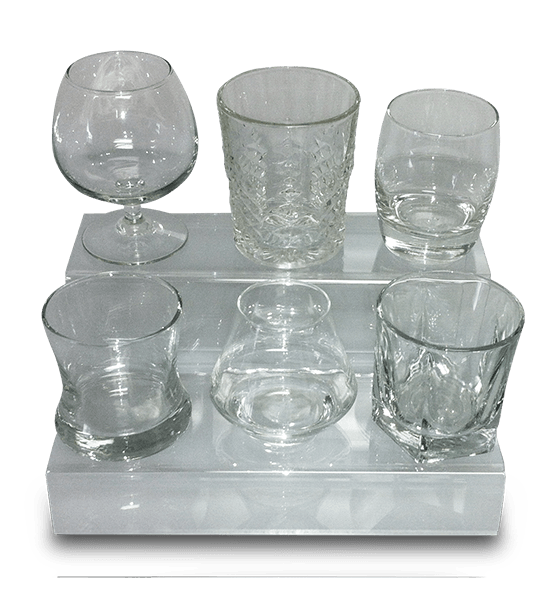 An international glass company wanted to display their line of whiskey glasses on a single display at a national retailer’s store location. 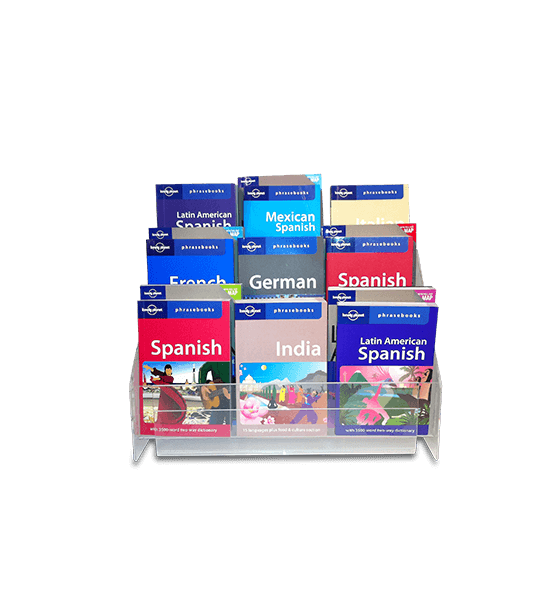 Lonely Planet wanted to develop a countertop travel guide display, custom-sized for nine of their popular titles. 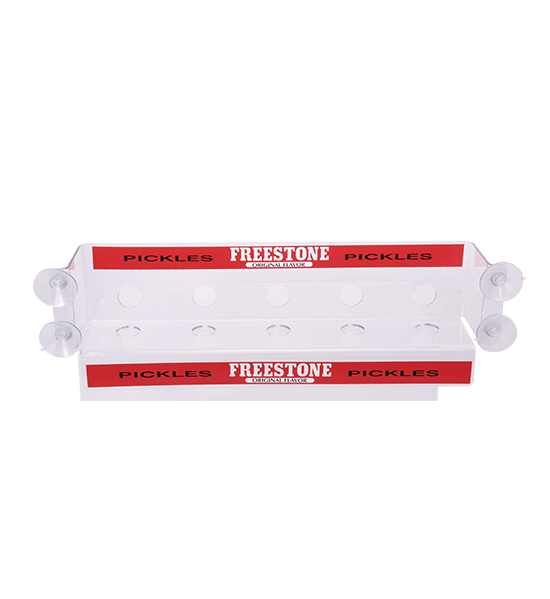 Freestone Pickle needed custom displays in cold storage aisles of grocery and convenience stores. Needed pickles to be seen. Putting pickles in point-of-purchase proximity to payment promotes premium performance. 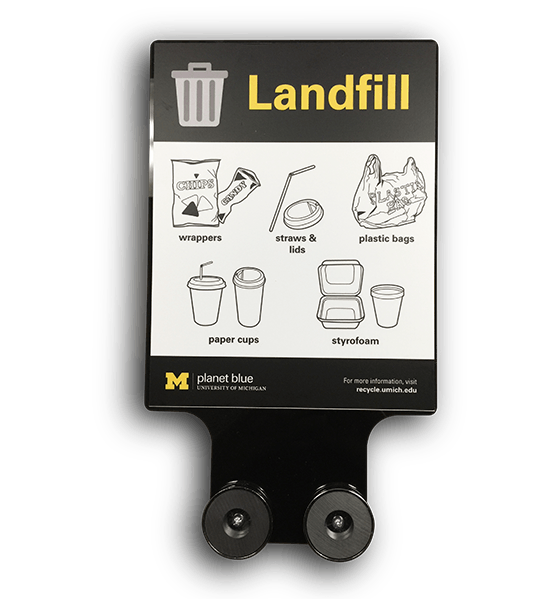 The Planet Blue team needed a way to get U of M students, faculty and staff to recycle A LOT of garbage ... properly. We partnered with a graphics co., using new technology to print full color graphics directly onto acrylic sheets. Children’s museum wanted a new exhibit to show kids how waves form, propagate and dissipate in large bodies of water. We built 12 display cases from 3030 Green Edge acrylic sheet to replace the glass displays that were breaking. 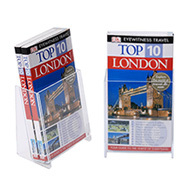 Landscape Slatwall Signholder holds literature 11 Inches Wide X 8-1/2 Inches Tall. Single Piece design is made from 1/16" Tough and Clear PETG. 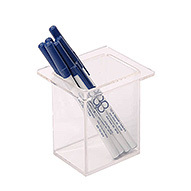 Attachs with suction cups (mounted along top edge) to any flat surface! Material is clear PETG. 4-1/4" wide X 7-7/8" tall. Slanted bottom on pockets keep Cards properly displayed! 3 card pockets with dividers in one slatwall unit. Also Holds Standard Business Cards. Pockets Are 3-3/4" X 1". Kicker Pushes Unit Out From Slatwall to keep cards organized. Designed to hold standard tri-fold brochures 4" X 9". Unit is also used as the international a4 brochure holder. Molded from clear Styrene. 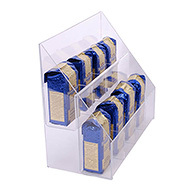 Four tier free-standing electronic gift card display with integral envelope holder. Gift card pockets are 1" deep and envelope pocket is 4-1/4" x 4-1/2" x 1-3/4". Made from tough and clear PETG. Shelftalker holds a sign 4" X 2". This signholder is made of tough clear PETG sheet so it's virtually unbreakable. Double Table Divider - Double "L"
Double "L" Table Divider: 4-3/4" (120 mm) X 16" (400 mm) made from 3/16" thick (4.5mm) Clear Acrylic. All exposed edges are polished and smooth. 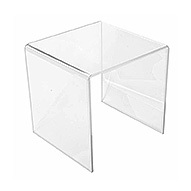 Deep Table Divider - Single "L"
Single "L" Table Divider: 4-3/4" (120 mm) X 7-7/8" (200 mm) made from 3/16" thick (4.5mm) Clear Acrylic. All exposed edges are polished and smooth. 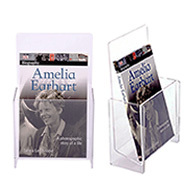 Free-Standing Countertop Brochure Holder for Literature 5-3/4" Wide X 9" Tall. Material: 1/8" Clear Acrylic. All Edges Polished. 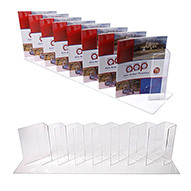 Free standing CD/DVD display made from clear acrylic with polished edges. 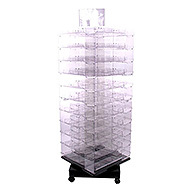 Holds 4 single CD/DVD's and 2 double CD/DVD'S. Screenprint reads "Now Playing"
Shelf Talker, Book Talker, Signholder. Holds literature 6" X 1-3/4". 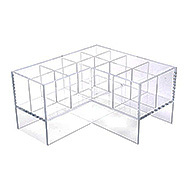 Unit is 6" X 1-3/4" X 5" with literature holder angled upward at 45 degrees. Clear PETG - virtually indestructible! All edges are polished and smooth. 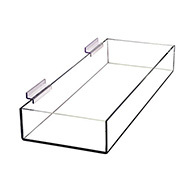 This U-Riser is made from 3/16" thick Clear Acrylic sheet. 8" Wide X 8" Tall X 15" Deep heat bent U-Riser. All edges are polished and smooth. 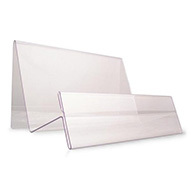 U-Riser is made from 3/16" thick Clear Acrylic sheet. 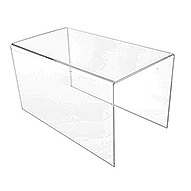 8" Wide X 8" Tall X 8" Deep U-Riser. All Exposed Edges are polished. Material: 3/16" Clear Acrylic. 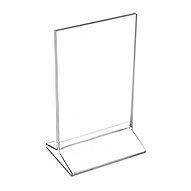 Free-Standing Countertop Brochure Holder for Literature 8-1/2" Wide X 11" Tall. Material: 3/16" Clear Acrylic. All Edges Polished. 840 Table Book End 33" X 15-3/4"
Versatile Countertop double sided display holds books, gift cards, stationery, box sets, etc. 33" Wide X 15-3/4" Deep x 7-3/4" Tall. All exposed edges polished. 3/16" Clear Acrylic. Custom 4 color sign printed directly on White Styrene sheet. 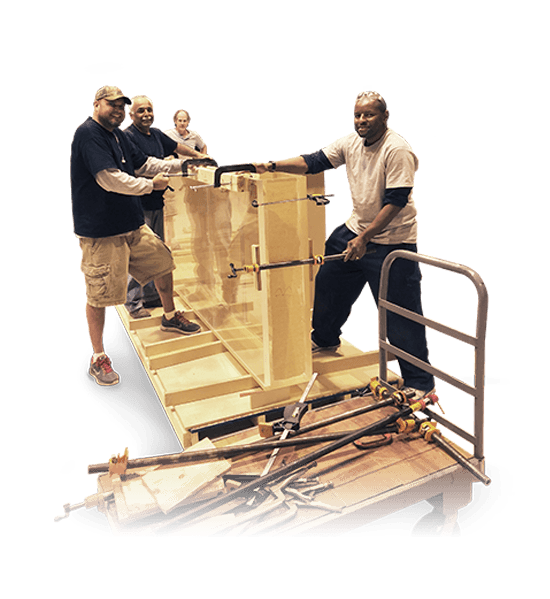 This process is excellent for low volume durable and colorful sign production. 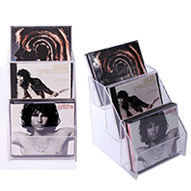 4-1/2" x 13-1/2" Faceout Product Display holds Books, CDs, DVDs, Candy, etc. 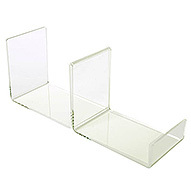 Floating Product holder is 6" tall. 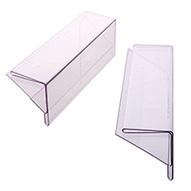 Lip is 4-1/2” X 3-3/8" Material is 1/4" Clear Acrylic. Bullnosed matte edges & smooth corners. 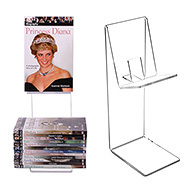 8 pocket face-out display for book series, art books, DVDs, etc. Fits most standard shelf units. 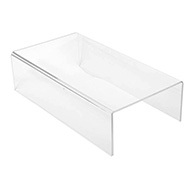 1/10" thick clear acrylic base is 34-1/2" X 7-1/2". 3/16" thick Pockets are 2-3/4" X 5-1/2" X 5-1/2". Book Holder 5" X 6" X 5"
Book Holder 5" X 6" X 5". Made from 3/16" Clear Acrylic. All edges polished and smooth. 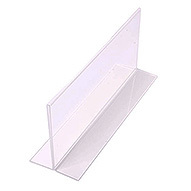 Countertop book or product display with front literature holder. 9-1/2" Wide X 6" Tall. 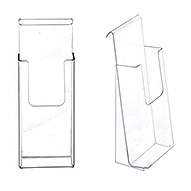 Front literature holder is 9-1/2" wide X 2" Tall. Material is tough clear PETG. 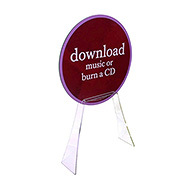 Single piece - Pocket is 2-1/4" wide X 6" tall x 1" deep & holds 100 - 200 standard bookmarks. 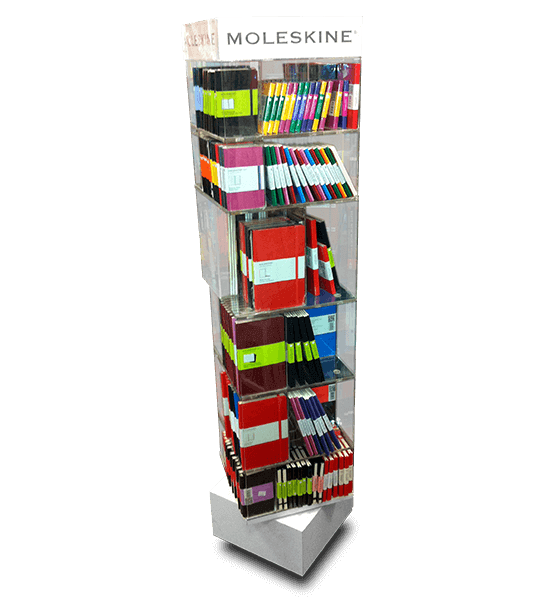 Free-standing display or mounted on slatwall. Clear PETG. 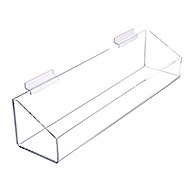 Countertop Circular Signholder holds signs up to 3/16" thick 9" above counter, seeming to float. Shown with a 13" diameter sign (sign not included). 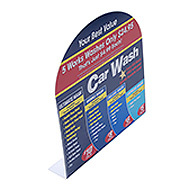 Four sided free-standing display is 22-1/2" X 70". 220 individual pockets are 3-1/4" Wide X 4-1/4" Tall x 5-3/4" Deep. 4-caster rotating black display base and 3 sided top signholder. 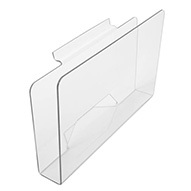 Standard slatwall media holder (newspapers, wide magazines, tabloids) keeps covers from bending forward. Made from 1/8" Clear PETG. Size: 11-5/8" Wide X 7-1/4" Tall X 1-1/2" Deep. For periodical, tabloid or soft cover. Made from 3/16" Clear PETG. Fits into standard slatwall grooves. Size: 9" Wide X 10" Tall X 3" Deep. Available in full front and newspaper version. 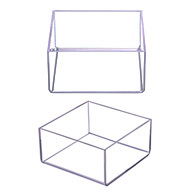 Top opening table tent with closed base to hold 4" wide X 6" tall literature. Protective film masking on exterior surface of finished product. 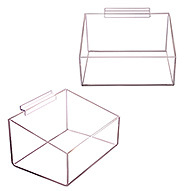 Top opening table tent with closed base to hold 8-1/2" wide X 11" tall literature. Protective film masking on exterior surface of finished product. 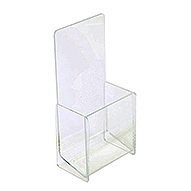 8-1/2" Wide X 11" Tall With Tri-Fold Brochure Pocket. Base is 3-1/2" Deep. 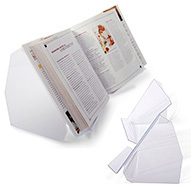 Tri-Fold Brochure Pocket is 4-1/8" Wide X 4-1/2" Tall X 1-1/4" Deep. Made from 1/10" Clear Acrylic Sheet. 22-1/8" Left to Right X 4-3/4" Front to Back X 4-3/4" Top to Bottom. Front Lip is 2-3/8" Tall. Two lengths of Z-bar for easy slat wall mounting. 4-1/4" Wide X 9" Tall. All Edges are Polished. 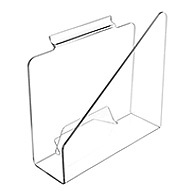 This Unit Is Also Used as the International A4 Slatwall Brochure Holder. 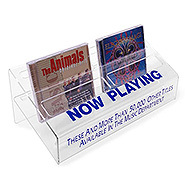 Countertop Display holds CD's, DVD’s, Books, Manga, etc. Store additional stock behind display. Includes literature holder at top and rear. Material is 1/8" Clear Acrylic. 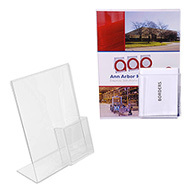 4-1/4" Wide X 9" Tall Brochure Holder Designed To Hold Standard 4X9 Tri-Fold Brochures. All Edges Polished. 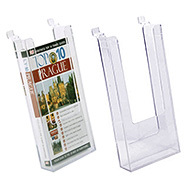 This Unit Is Also Used as the International A4 Brochure Holder. 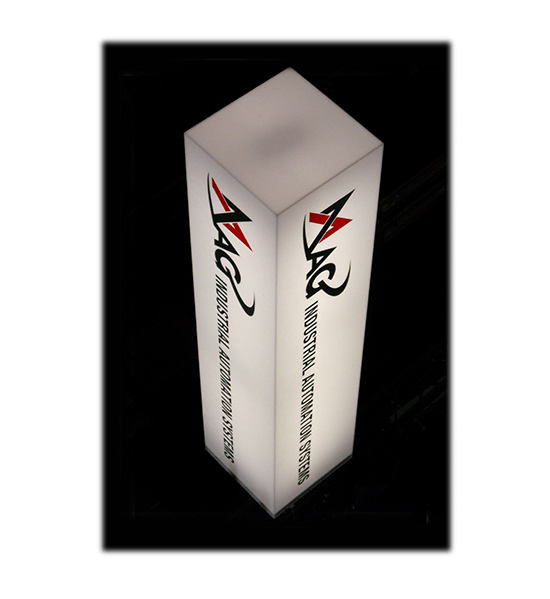 6" Diameter X 3" Tall Cylinder Display with solid base. 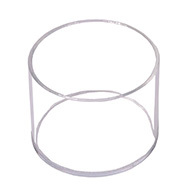 Clear Acrylic Tube - 1/8" wall thickness. 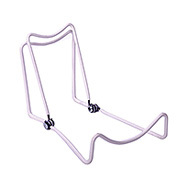 Includes 4 Non-Skid Urethane Bump-Ons. Holds literature 7" Wide X 2-1/4" Tall. 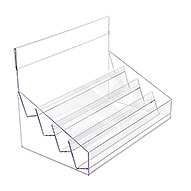 Literature holder parallel to shelf front. Pre-Bent Material Blank is 7-1/16" X 13-1/2”. 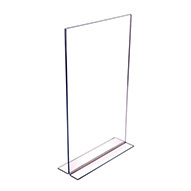 Display Cylinder 4" (OD) Diameter X 3" (OD) Tall with solid base. 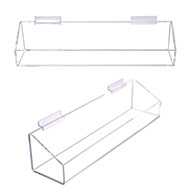 Clear Acrylic Tube - 1/8" wall thickness. Includes 4 - Non-Skid Urethane bumpers on Bottom of Base. 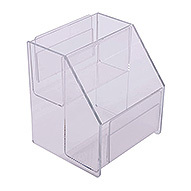 TW-2681 6" X 6" X 3” Small Counter 6" Wide X 6" Deep X 3" Tall. Made from 1/8" Clear Acrylic Sheet. All Edges Flame Polished. Medium Slatwall 22" Wide X 8" Deep X 3” Tall. 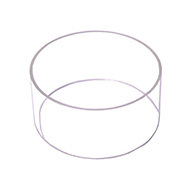 3/16" Thick Clear Acrylic. All Perimeter Edges Polished. Bin does not include Dividers. 11"Wide X 8" Deep. 6” Tall at the Back and 4" Tall at the Front. Made from 3/16" Clear Acrylic. 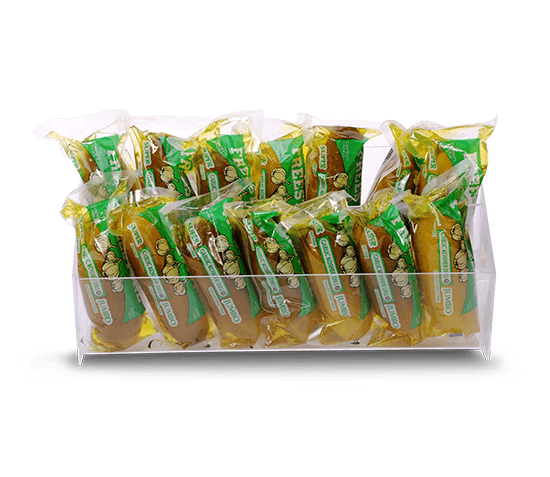 Slatwall Bin Dividers are not included with this display. 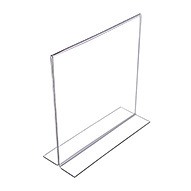 Bottom Opening Signholder holds literature 10" Wide X 10" Tall. Made from tough and clear 1/16" PETG Sheet. Edges as Saw Cut - No chips or burrs. 11-7/8" Wide X 11-7/8" Tall X 18" Deep heat bent U-Riser. All edges are polished and smooth. 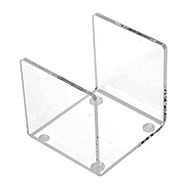 Made from 1/4" thick Clear Acrylic sheet. TW-6002 Book Holder 5" X 6" X 5"
5" Wide X 6" Tall X 5" Deep. Made from 3/16" Clear Acrylic. All edges polished and smooth to touch. Unit comes with non-skid bump-ons to prevent unwanted movement on countertops. 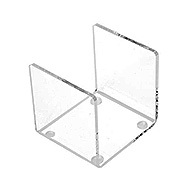 TW-6003 Book Holder 4" X 4" X 4"
4" Wide X 4" Tall X 4" Deep. Made from 3/16" Clear Acrylic. All edges polished and smooth to touch. Unit comes with non-skid bump-ons to prevent unwanted movement on countertops. 15" Wide X 12" Tall X 7" Deep. Includes a 2" X 15" Signholder along the Top Header and a 2" X 15" Signholder along the Front Lower Lip. 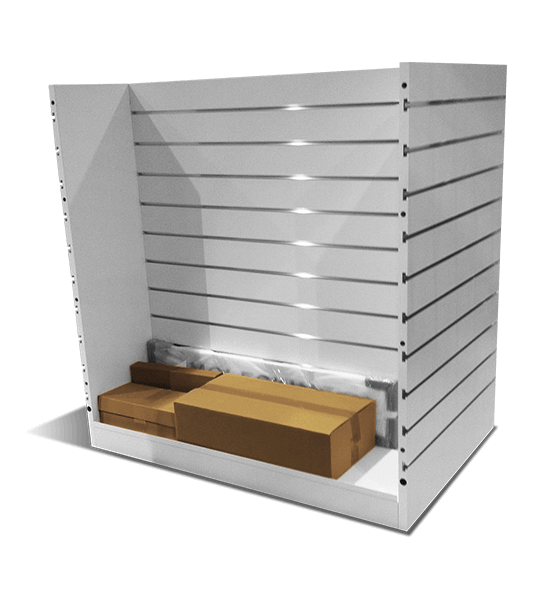 Shelves are 1-5/8” Deep X 2-3/4” High. 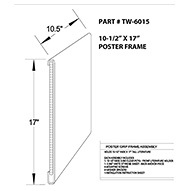 Poster cover is made from tough and clear 0.060" Clear PETG and a white styrene wall mount panel. Includes mounting hardware and an installation instructions. 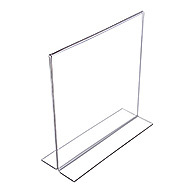 Bottom Opening Signholder holds literature 12" Wide X 5" Tall. Made from 1/10" Clear Acrylic Sheet. Edges are Saw Cut - No chips or burrs. 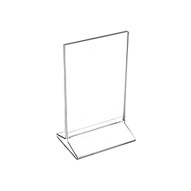 Bottom Opening Signholder holds literature 10-1/2" Wide X 17" Tall. 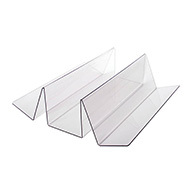 Material is 1/10" Clear Acrylic Sheet. 15-1/2" Wide X 31" Tall Bottom Opening Sign Holder. Includes 2 - U-Clips at bottom for closure. Made from 1/8" Clear Acrylic. All edges Flame Polished. 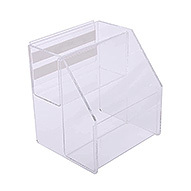 Countertop Customer Comment Card Holder, Postcard Holder, Brochure Holder. Made from 1/10" clear acrylic sheet. Edges are flame polished. 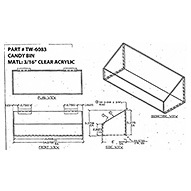 TW-6083 Candy Bin 14-3/8" X 6" X 5-3/8"
14-3/8" Wide X 6" Deep. Back Height is 5-3/8, Front lip is 2-1/2" Tall. 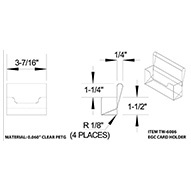 Includes 2 - 2-3/4" Lengths of Z-Bar for mounting. Does not include removable dividers. 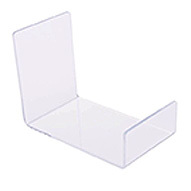 Single Pocket Gift Card Holder attaches to front of many different displays! Made from tough and Clear PETG. 22-1/8" Wide X 4-3/4" Deep X 4-3/4" I.D. Tall. Front Lip is 2-3/8" Tall. Two Lengths of Z-Bar for easy Mounting. Does not include any removable dividers. Holds CDs, Books, Manga, etc. Store additional stock behind the front products. Includes literature holder at top and rear of display. Pockets are 2-1/2" deep. Holds CDs, Books, Manga, etc. Store additional stock behind the front products. 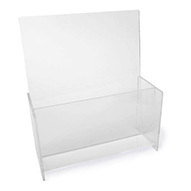 Includes literature holder at both the front and rear of display. 13-1/8" Wide X 11-3/4" Tall X 6-1/2" Deep. Eight individual Pockets are 3" Wide X 3" Deep each. Made from 1/8" Clear Acrylic. An inexpensive and flexible steel countertop book/product easel! Many uses, very durable, excellent value.